There are probably very few Canadians who have not watched Susan Boyle’s emotional video on You Tube. What is perhaps more interesting, however, is that Canadians watch more videos than many other countries including the United States, France, Britain and Germany. According to a recent comscore survey, 21 million Canadians watched 3.1 billion videos (1.6 billion on You Tube alone) in February, 2009. It would appear that Canadians have a real passion for the medium and it should be no great surprise that many of us are turning to videos for travel and entertainment information about Nova Scotia. For example, an informal survey of ‘tidal bore rafting’ videos on You Tube and other websites reveals that the number of videos this year have more than tripled the numbers for 2008 (and there is still a lot of good rafting time left). And the productions, well, they are really quite good! So good in fact we have looked at all of the rafting videos from this and previous years and have selected the Top Five Tidal Bore Rafting Videos in Nova Scotia. 1. Title: Shubenacadie Tidal Bore Rafting – September 21st, 2009 (6.50 minutes) – It is no accident that the first two of our top five choices are videos from Daniel Marshall, an avid tidal bore rafting fan and a Nova Scotian. His You Tube channel reveals several well edited, thoughtful and informative videos of his visits to various Nova Scotia destinations. While many are a little lengthy, they are great to watch and very entertaining. One which deserves a special mention is his filming of the pounding tidal bore surf hitting the bow of his Zodiac tour boat. One could feel the roll of the waves, as his camera, often submerged in muddy water, captured each wave as it broke across the bow. 2. Title: Shubenacadie Tidal Bore Rafting – September 8th, 2009 (6.50 minutes) – In both this and Daniel’s September 21st video one quickly learns that the ‘tidal bore rafting’ experience can be more than just riding the waves. It is fun in the mud of the Shubenacadie River. Daniel’s filming of his friends sliding, falling, rolling and laughing in the dark mud near Maitland, Nova Scotia will bring a smile to your face. After watching this video mud sliding is something you will want to consider with your next tidal bore rafting adventure. 3. Title: Tidal Bore Rafting Bay of Fundy – November 8th, 2007 (3.43 minutes) – While lacking the impact and clarity of some of the other productions, motorcyclist Matt from Waverley, Nova Scotia has produced a first-class video. The music track works well, the editing is smooth and Matt’s filming of neighbouring Zodiacs climbing wave after wave on the river would have required a steady hand for sure. Matt’s video is the most popular ‘tidal bore rafting’ video on the internet and has received nearly 12,000 views on You Tube. 4. Title: Tidal Bore Rafting, Bay of Fundy, Nova Scotia, Canada – August 20th, 2009 (1.57 minutes) – When you’re watching this video it is not difficult to imagine why wetsuits and a change of clothes are strongly recommended when enjoying a tidal bore rafting adventure on the Shubenacadie! With the river waves pounding over the bow of the Zodiac, the water constantly filling the boat and splashing the faces of passengers, you quickly discover why they are so important on a rafting tour! But it is all good fun and this popular You Tube video is one of the best. 5. Title: Tidal Bore Rafting – August 8th, 2008 (5.48 minutes) – As you might expect, the production of this Hospitality Guide video is the most professional of all the video material considered. There are interviews with rafting staff, customers, drivers and background information has been added, making it much more informative than the other videos. The production falls short, however, in the actual filming of the action on the water. You don’t feel the excitement or magnitude of the waves associated with a rafting adventure. Despite the shortcomings, the video is well done and certainly worthy of a top five designation. Today marks the beginning of a visual arts celebration of the Shubenacadie Canal. This historic canal and waterway connecting the Bay of Fundy with the Atlantic Ocean was considered a 19th century mega project and flourishes today as an important recreational resource for all of us to enjoy. The Shubenacdie Art Connection is the first of what many hope will become an annual event of local art exhibits stretching along the length of the waterway from Maitland on Cobequid Bay to the Dartmouth, Nova Scotia waterfront. For two weeks and three weekends from September 19th to October 4th, 2009 twenty-two artists will showcase their love and appreciation of the canal and the Shubenacadie River region. Among those participating in the event are well-known oil paint artists, Sarah Jane Conklin of Fall River and Carol Morrison of Oakfield; pastel artist, Janice Guinan of Bible Hill and versatile watercolour artist, Gail Sutherland of Bedford (just to mention a few). Guinan, who paints portraits, landscapes and seascapes usually in pastel, also works in watercolour, acrylic and oil. Guinan notes that her ancestors came to the area in the 1700s and settled in Riverside, near Maitland, Nova Scotia. She said she has often wondered if her family (originally from Ireland) might have helped in the building of the canal. Work on the Shubenacadie Canal system began in 1826 and was finally completed in 1861. Between 1856 and 1870 steam ships hauling barges moved gold mining equipment, coal, lumber, bricks, and granite through the intricate system of nine locks along two planes on the canal. By 1870, however, the dawn of an efficient railway system in Nova Scotia that was able to transport goods across the province faster and more cheaply made the canal obsolete. 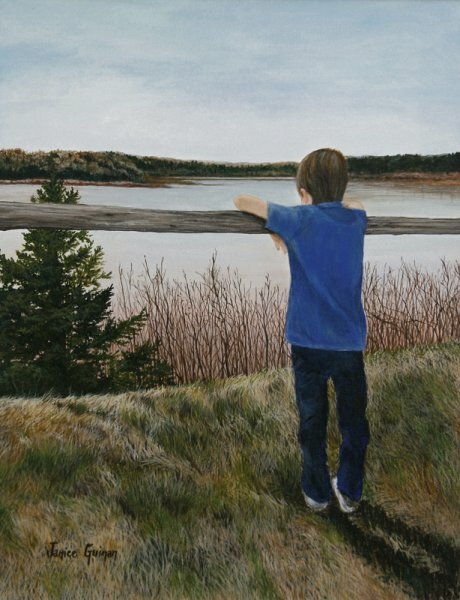 The Look-Off by Janice Guinan of Bible Hill is among the many pieces of visual art featured at The Shubenacadie Art Connection (series of exhibits) beginning today in Central Nova Scotia.